Uzma is our women's self defense instructor. Her passion for healthy living, eating and fitness has led her to train in a range of fitness activities including pilates, yoga, spinning, rowfit and Bar Method but it wasn't until she took up boxing that she found her true passion in combative sports. Combative sports combined her love of physical fitness and cardio training, with the ability to learn new skills and empowerment through self-defense. Delving into the world of Krav Maga was the natural next step and Uzma regularly trains at UMA in our Krav Maga program. She's a certified Fit-to-Fight level I instructor since April 2015 and currently Brazilian jiu-jitsu student and is continuing her training jiu-jitsu along with Krav. A petite woman, Uzma is proof that any woman, no matter her size, can learn to defend herself. 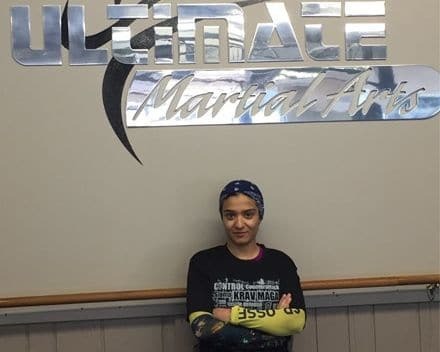 Through her weekly classes, Uzma works with women at all fitness levels to provide them with a unique class of cardio training and empowering and confidence rising self-defense techniques along with common sense tactics to ensure their safety. She also enjoys international travel so be sure to ask her how she stays fit on the road!